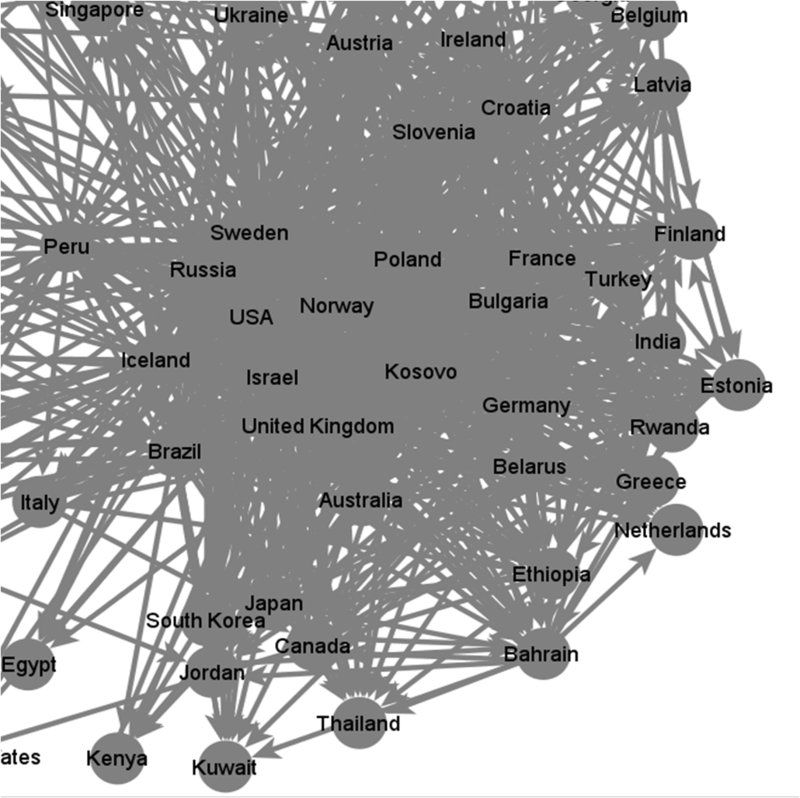 In order to learn if foreign ministries do indeed follow each other on twitter, I compiled a sample of 70 countries and analyzed which ministries follow their peers. The result of this analysis was a social network of foreign ministries spanning the globe. Once I had built the network, I was able to answer the most important regarding social networks- who is the most popular kid in the class? Which ministry has the most followers? The data I had gathered also enabled me to answer two additional questions- which ministries are devout followers of other ministries and, perhaps most importantly, which ministries serve as import crossroads of information within this particular social network. Using the Visone program, I mapped this new social network as can be seen in the illustration below. The most dense area of the network, or its core, includes both the most popular ministries in this network as well as those ministries that are avid followers of their peers on twitter. Characterizing this network called for the calculation of three parameters: in-degree, out-degree and betweenness. 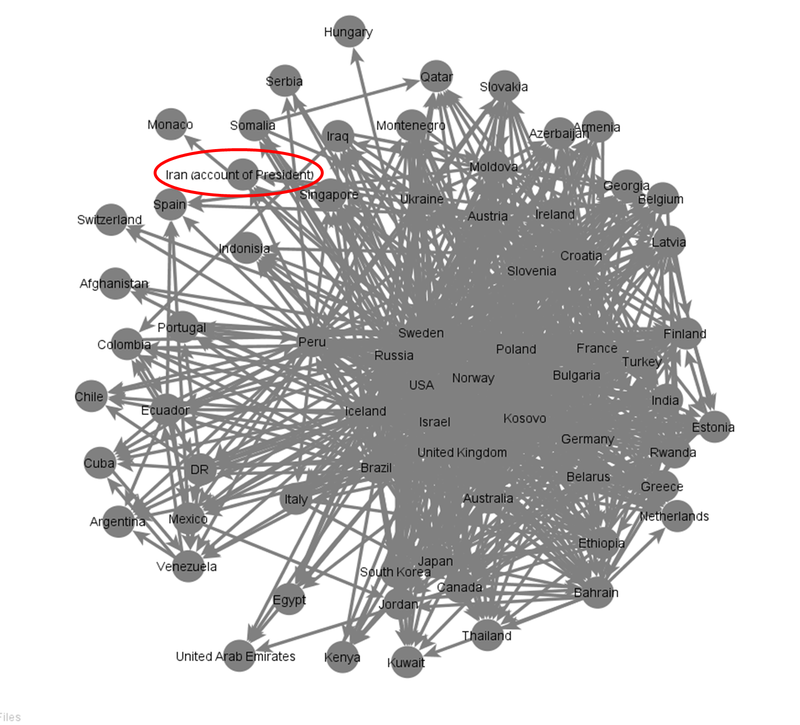 With regard to popularity, or the in-degree parameter, it appears that the United States and the United Kingdom are the equivalent of a high school quarterback in this social network each followed by 43 other ministries (See illustration below). In third place is Poland followed by Russia, Sweden, Israel, India, France, Germany and Turkey which comes in at tenth place. The out-degree parameter, which indicates the amount of ministries with whom one ministry has contact, is of paramount importance in this network as the higher a ministry’s out-degree score, the greater its ability to disseminate information throughout the network. The country with the highest out-degree is Iceland followed by Sweden, Israel, Norway, Russia, Poland, Kosovo, Bulgaria, Brazil and Peru (See illustration below). It is important to note that Sweden, Israel, Russia and Poland are the only countries to appear in both lists indicating that they are highly popular and able to effectively disseminate information throughout the network. Calculating the betweenness parameter revealed which ministries serve as important hubs of information linking together ministries that do not follow each other directly. The country with the heights betweenness score is Sweden followed by the UK, Russia, USA, Poland, Israel, Norway, Brazil Iceland and Ecuador. The only countries to receive high scores on all three parameters, or the A-Team of digital diplomacy, are Sweden, Russia, Poland and Israel. 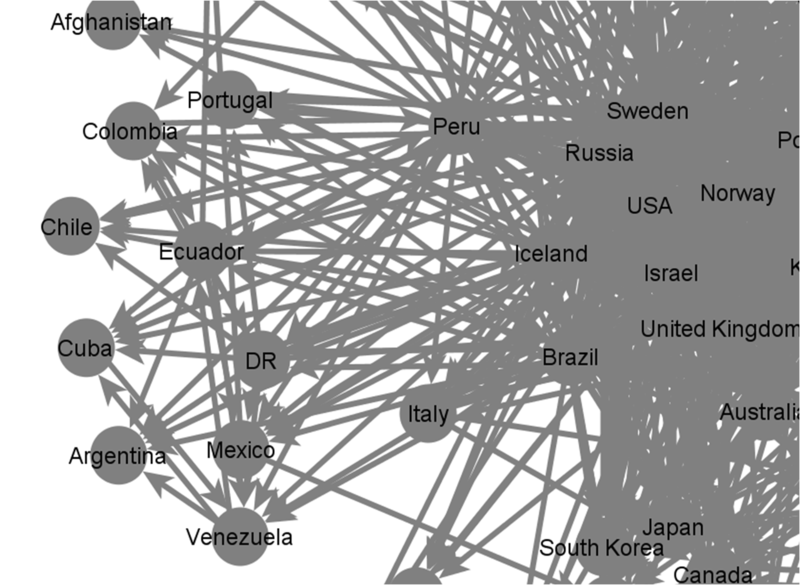 It is interesting to note that all South America countries seem to huddle together at the periphery of the network with Ecuador serving as an important information hub for this group (See illustration below). As can be seen below, there are additional findings that warrant attention. First is the relatively poor standing of the President of Iran’s official twitter account. While Iran dominates world news, it is not dominant in this network. This could, however, be the result of the fact that the channel evaluated here belongs to a political figure and is not the foreign ministry’s official twitter channel (which I have yet to find). Secondly, as opposed to Kenya and Somalia, Rwanda and Ethiopia are followed by many ministries and are therefore located near the core of this network. Thirdly, this network shows Ukraine to be somewhat isolated which is surprising given its current prominence in world news. However, the data presented here was gathered during the beginning of January before tensions in Ukraine reached fever pitch. Currently,Ukraine’s foreign ministry is followed by 27 other ministries in this network making it the tenth most popular ministry bumping Turkey to eleventh place. Finally, like South American countries, most Arab states in this network are huddled in its periphery. 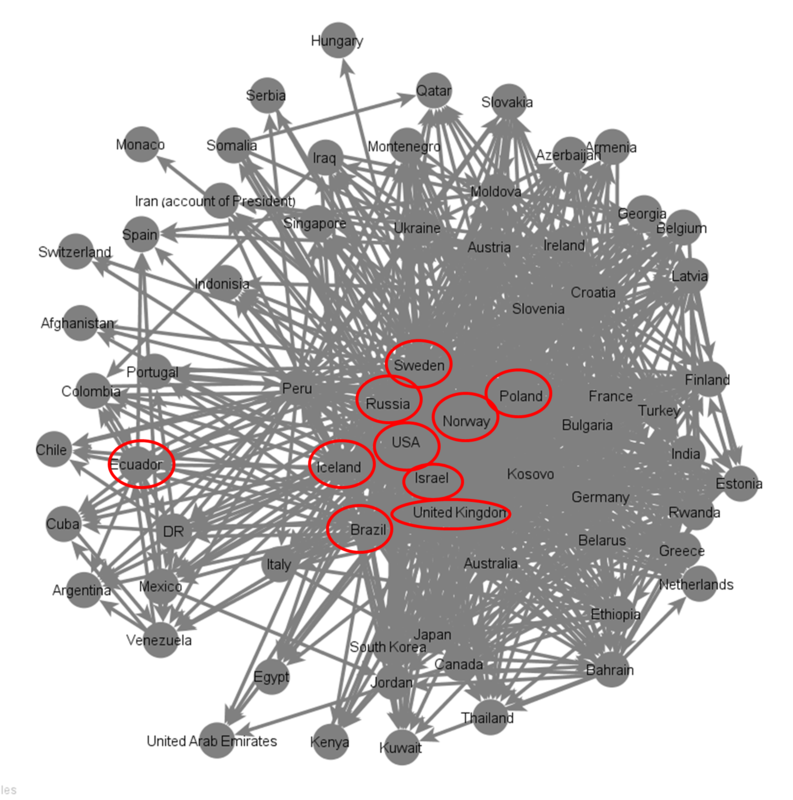 A possible explanation for this similarity is the fact that most of these countries tweet in local languages (i.e., Spanish and Arabic) and not in English. It would be fascinating to learn if foreign ministries are aware of their prominent position within this network. Does Ecuador’s foreign ministry know that it serves as an information hub for South American countries? Does Kosovo know that it has the ability to spread foreign policy messages effectively throughout the entire network? Does Poland know that it has positioned itself at the very heart of the foreign ministry social network? And if so, do all these ministries use this information when practicing digital diplomacy? This is truly interesting, i.e. to observe through social networks the nexus between various countries’ interest pursued through their foreign ministeries. I wonder though where would Romania’s diplomats fit in?! 2) To the best of my knowledge, contemporary Digital Diplomacy is confined mainly to a bilateral domain of Diplomacy called Public Diplomacy. That means that the Digital Diplomacy resources invested by foreign ministries are channeled mainly to communication on a country to country level (G2P). Therefore, I draw 2 main conclusions from your article: a) there is room for multilateral Digital Diplomacy, b) to truly understand the level of Digital Diplomacy influence of countries, further research will have to take into account also the hundreds of individual Embassy Twitter accounts for each country. After all, it is those embassy accounts that channel the lion share of information exchange. Your sample looked at the accounts of Ministries. That means, accounts managed by officials based in their own capitals. I think your research could be expanded if you look at multilateral hubs. At the UN in New York for example, numerous Missions have twitter accounts, follow each other and re-tweet each other, especially on issues of common interest. UNSC members often follow each other not only as part of their diplomacy but as intelligence gathering. I would not be surprised if that is also the case in Geneva, Vienna, The Hague, Brussels, Addis. Another place of interest might be DC. I definitely think that the interest of states is more diversified in these fora and may not mirror the digital behaviour in capital, so I am looking forward you replicating your experiment in multilateral settings. There is no such thing as Digital Diplomacy. Twitter accounts are the equivalent of Ministry’s Press Bureau. It’s an official channel of communications. In diplomacy, the core channel is the secret service. Social media acts just like a theater stage. There are connections, and there are connection – esp in Twitter, where “Follow” request do not require approval. 1. The two ministries use the connection to study each other’s policies (i.e. informational relationship)? 2. The two Ministries use their twitter connection to engage in dialogue (dialogical relationship)? 3. The two ministries retweet each other’s materials (collaborative relationship)? 4. The two ministries ignore each other (no relationship)? I am currently completing a study of digital public diplomacy in the foreign office of a specific country. One of the things I’ve discovered is that embassies will use Twitter for two main functions: to disseminate information to target audiences, and to establish relationships with specific individuals. These functions serve various purposes, such as to popularize “messages”, influence key players like journalists and politicians, learn about recent trends in Twitter, and correct erroneous information reported in the mainstream press…). Neither the purpose of a Twitter connection, nor the nature of the relationship represented by it, can be assumed. Both need to be fleshed out. In sum, to validly infer how much benefit and traction countries truly enjoy on Twitter, one would need to map the nature, frequency and direction of information flows between their Twitter accounts. The visual network that you’ve created is, potentially, an important first step in this direction. A powerful share, I simply given this onto a colleague who was doing just a little evaluation on this. And he the truth is bought me breakfast because I discovered it for him.. But yeah Thnkx for spending the time to debate this, I feel strongly about it and love studying extra on this topic. for me. Big thumb up for this blog submit! I think this is one of the such a lot vital info for me. And i am happy reading your article.